The Curious Ride of Mister Bigglesworth. Oh, sometimes you’ve just gotta be silly. This little drawing was done to take a break from some of the super dark themed work lately and was a lot of fun. There was strong response to this piece the other night, so I think Mister Bigglesworth may ned to make a few more appearances. For now, enjoy him on his curious ride. This dual print release is a darker set, featuring both “Biomecthulhu” and “Necrotic Tidings.” Both will be released in a super limited quantity- only ten each! As always, prints are hand signed and numbered and always ship flat. Don’t forget- if you purchase both prints (or more!) you only pay one set of shipping. 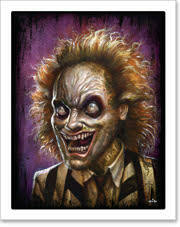 Domestic shipping has also been reduced for this print release, to $9.95 anywhere domestically. You can purchase prints and other available artwork through my online shop. Enjoy! Limited edition of only 10, each print is hand signed & numbered. Available for $30 each plus shipping here. detail I put a print release in your print release so you have prints with your prints! A new painting for your viewing pleasure. Colored inks and acrylics on watercolor paper, varnished.